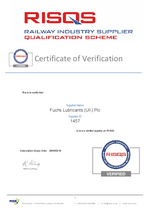 The FUCHS UK site holds the following certifications. The design, development and manufacture of lubricants and special fluids/products for use in automotive, industrial, defence and aerospace applications. This standard specifies additional requirements for a quality management system for the aviation, space and defence industries. The design, development and manufacture of lubricants and special fluids/products for use in automotive and industrial applications. The design, development and manufacture of medical and technical grades of soft paraffin and white oils. 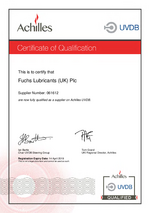 The storage and distrubution of FUCHS Lubricants products. 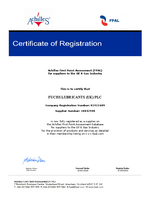 The certificate is in conjuction with Aerospace certificate FM 58508 - AS9100C. 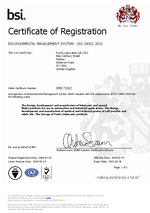 This specification defines the Standard for an environmental management standard (EMS). It enables the control of environmental impacts of the company. Specifies requirements for establishing, implementing, maintaining and improving an energy management system, whose purpose is to enable an organisation to follow a systematic approach in achieving continual improvement of energy performance, including energy efficiency, energy use and consumption. Specifies requirements applicable to energy use and consumption, including measurement, documentation and reporting, design and procurement practices for equipment, systems, processes and personnel that contribute to energy performance. This standard specifies requirements for an OH&S management system to enable an organisation to develop and implement a policy and objectives which take into account legal requirements and information about OH&S risks. This Technical Specification, in conjunction with ISO 9001:2008, defines the quality management system requirements for the design and development, production and, when relevant, installation and service of automotive-related products. 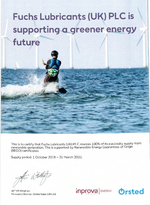 Certifies that FUCHS sources 100% of its electricity from renewable generation. Medicinal products manufactured in the UK must be produced on a site that holds an appropriate manufacturer's licence (ML). The licence is issued, routinely inspected and audited by the Medicines and Healthcare Regulatory Agency (MHRA). Cyber Essentials is a simple but effective, Government backed scheme that helps protect organisations of all sizes against a whole range of the most common cyber attacks. 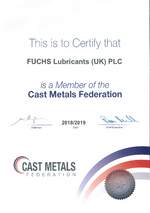 This Certificate certifies that FUCHS UK's ICT defences were assessed as satisfactory against commodity based cyber attack, at the time of testing. We pride ourselves on our high quality of products and service which is shown through our registration with leading industry organisations. UVDB is the utility industry pre-qualification system used across the UK. 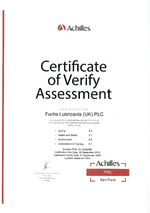 FUCHS LUBRICANTS (UK) plc is fully qualified as a supplier on Achilles UVDB. The AMRC provides the opportunity for collaborative research allowing businesses like FUCHS to commision specific machining projects. 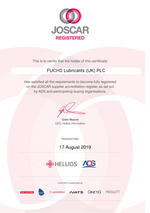 Top Safety Accreditation for FUCHS LUBRICANTS (UK) plc. FUCHS UK have been awarded accreditation from Alcumus SafeContractor for achieving excellence in health and safety in the workplace. ABMEC is the trade body representing manufacturers promoting safety, efficiency and technical developments in the global mining industry. Global Supply Chain Risk Management. Avetta connects the world's leading organizations with qualified suppliers, contractors and vendors. Avetta's global solution combines adaptive technology with industry-leading professional services and local expertise; building trustworthy bonds between leading organizations and qualified suppliers. As the single voice for the UK foundry industry, CMF promotes the UK castings industry as a whole, influencing discussions with government bodies, negotiating and consulting on UK and European legislation that affects us all. As a Member of the European Foundry Association (CAEF) and the Metals Forum, CMF are well placed to inform and influence. 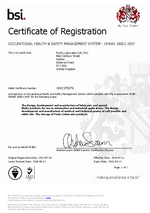 CHAS is established as the market leader for health and safety pre-qualification in the UK, dedicated to completing health and safety pre-qualification assessments to a nationally recognised and accepted threshold standards. FPAL works to identify, qualify, evaluate, and monitor suppliers to the oil & gas industry on behalf of its purchasing members. FPALs build and supports buyer-supplier communities, creating an effective Supply Chain network. JOSCAR is the new accreditation system for the aerospace, defence and security sectors. The system was established following an initiative led by ADS Group and includes a growing number of prime contractors as registered buyers. A cross-sector collaborative solution which reduces the time, cost. resources and duplication currently needed to provide information to major customers. Holding common supplier data in a central system, the JOSCAR accreditation system allows information to be accessed by all participating buying organisations. The Midlands Aerospace Alliance was formed in 2003 to support and represent the aerospace industry across the Midlands region and has over 250 members. 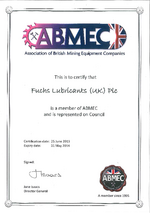 FUCHS Silkolene is a proud member of the Motorcycle Industry Association (MCIA). The MCIA works closely with members and a wide variety of stakeholders such as the Government and its agencies, police, press and road safety organisations to promote, protect and expand the UK motorcycle industry. The Railway Industry Association is the representative body for UK-based suppliers of equipment and services to the rail industry, with over 150 member companies. RISQS provides a single common registration, qualification and audit process for suppliers, that is shared by the UK rail industry. Signatories to SC21 are committed to developing supply chains to ensure they remain competitive and able to deliver increased value to customers. We have achieved the Silver Award through our commitment to achieving and maintaining excellent levels of delivery, quality, sustainable improvement and business improvement frameworks. TransQ Global is a supplier registration and pre-qualification system used by buyers in all areas of the transport sector to have up-to-date and validated supplier information, and to procure efficiently in accordance with EU regulations. The community covers rail, road, air, maritime and logistics. The United Kingdom Lubricants Association is the UK’s leading trade association, representing over 100 companies. Members include multi-national major oil companies, independent lubricant manufacturers and raw material suppliers.